The Co-op Handbook is our community guide with information about many aspects of our Co-op. It is a must-read for every cooperator! We have presented the Handbook on this Website for you to read easily in PDF format. 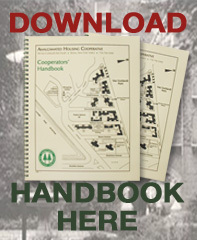 Click on the image to the right or here to view the Co-op Handbook. If you are interested in applying to our co-op, please click here to download the document. Please note: This application must be printed on legal size 8.5″ x 14″ paper. All applications must be brought into the Co-op Office or mailed to 98 Van Cortlandt Park South, Bronx, NY 10463 with a non-refundable money order of $75.00. Original application will be time and date stamped upon receipt and entered into NYS Homes and Community Renewal’s Automated Waiting List (AWL) in chronological order. Applicant will be given a print out of AWL summary with application number. Applicants can monitor waitlist position and update their contact information using AWL’s public access function @ www.nyshcr.org.